In the heat of Arizona summers, your skin is always at risk. Too much UV (ultra-violet) radiation from the sun can damage your skin cells. This can result in sunburns, heat rashes, skin cancer, or more. 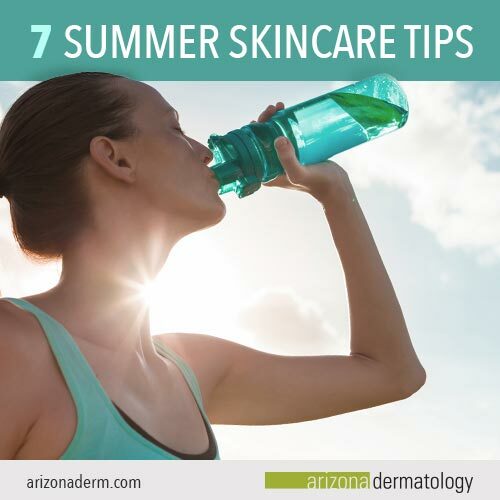 To avoid these skin risks, make sure you know how to properly care for your skin during the heat of the Arizona summers. Sunscreen is a daily necessity in Arizona. It helps fight against negative implications of the sun such as skin cancer, premature aging, and sunburns. Contrary to popular belief, sunscreen isn’t something you just put on when visiting the beach on a hot summer day. The Centers for Disease Control and Prevention recommends wearing sunscreen on a regular basis—even on cloudy days. There are two main categories of sunscreens: physical and chemical. Physical sunscreens work like they sound. They physically block and reflect the sun’s rays away from your skin. Chemical sunscreens, on the other hand, usually utilize compounds such as oxybenzone and avobenzone. These compounds absorb the sun’s rays without causing harm to your skin. Sunscreens are graded by SPF, or sun protection factor. The higher the SPF, the more protection you’ll get against UV rays. We recommend selecting sunscreens that have an SPF of 30 or higher. Additionally, you’ll want to make sure the sunscreen includes protection from both UVA and UVB sun rays. This information is denoted on the packaging of the sunscreen. Drinking water daily is crucial, especially in the heat of Arizona summers. Without enough water, you can become dehydrated. Dehydration can lead to a wide range of complications including tight, dry, and flaky skin. Drinking water helps replenish any fluids you may have lost from excessive perspiration in the heat, ultimately working to eliminate dry, damaged skin. We recommend drinking eight 8-ounce glasses of water every day. However, keep in mind, this amount of water works for the average day. It does not take into account physical activity. If you plan on participating in any physical activities, especially outdoors, you’ll need to increase your water intake since you’ll likely lose more fluids. Nothing feels better than a hot shower after a long day. However, what you may not realize is that hot showers negatively affect your skin by drying it out. This dryness can cause your skin to crack and create irritation. Many times, we find that the risk of these implications grow higher in the summertime, since the skin might already be damaged from the impact of the sun. We recommend giving your skin a break in the summertime by taking lukewarm to cold showers, depending on the temperature you’re most comfortable with. By swapping hot showers for cold showers, you’ll help retain moisture in your skin and reduce the dryness you experience in the hotter months. Next, we recommend wearing protective clothing. When used in combination with sunscreen, protective clothing can be a valuable tool for shielding your skin from the harsh effects of the sun. Try wearing wide brimmed hats, large sunglasses, and clothing made from fabrics like linen to keep you cool, and more importantly, protected from the sun. The sun can take a lot out of you, both mentally and physically. Arizona’s heat is notoriously dry, unlike much of the country. Meaning, there’s very little moisture in the air. Over time, this lack of moisture can take a toll on your skin, leaving it dry, flaky, and oftentimes in pain. To avoid these undesirable symptoms, apply moisturizer twice daily; once in the morning and once at night. Moisturizers will quench your skin’s thirst and keep it from becoming dry and damaged. What moisturizer should you use? Non-comedogenic: Moisturizers that are non-comedogenic are specifically formulated to not clog pores. Hypo-allergenic: Moisturizers that are hypo-allergenic reduce the likelihood of allergic reactions. In addition to combatting dry skin, oily skin is another issue you may have to tackle, especially during the summer. Hot Arizona days can cause your skin to produce more oil and sweat than normal. Unfortunately, this excess oil production can lead to acne breakouts and other skin irritations. We recommend using oil free cleansers and exfoliating your skin during the hotter months. Oil free cleansers will help prevent oil production. Exfoliators will help remove dead skin cells from the surface of your skin. This makes it easier for products to penetrate deep into your skin, allowing them to perform their tasks at hand—including decreased oil production. Unfortunately, even after taking all precautionary measures, the sun can still damage your skin. When or if this damage happens to your skin, it’s important to know how to handle your situation. If you have a sunburn, treat your symptoms immediately. Doing so will give your skin an ample amount of time to heal. Some excellent tactics for treating damaged skin include moisturizers and chemical peels. Additionally, medications can help treat painful symptoms associated with sunburns. As soon as you notice any symptoms coming on, try taking ibuprofen, such as Motrin or Advil, as well as using 1% hydrocortisone cream. These medications will help sooth your skin and mediate your pain. Avoiding the sun in the heat of Arizona summers is near to impossible. But, with our helpful tips on your side, you’ll be ready to embrace the heat without worrying about damaged skin. For more information on sun damage, skin cancer, and more, feel free to reach out to us to schedule a consultation appointment. At Arizona Dermatology, we’re always here to help.